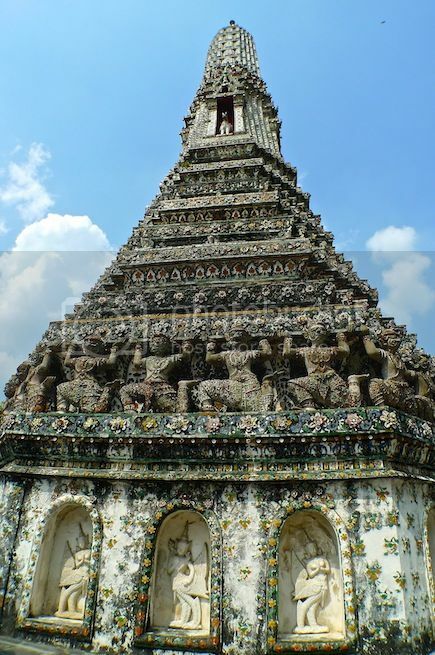 Located on the west bank of Chao Phraya River in Bangkok, Wat Arun also known as Temple Of Dawn, is a major tourist attraction in Thailand. 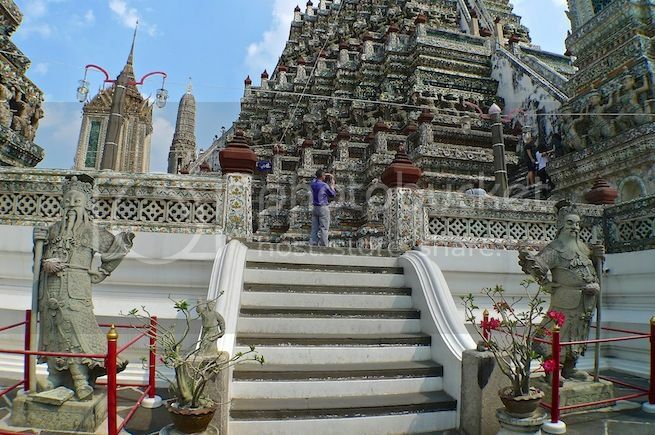 During my 3rd day in Bangkok, I visited Wat Arun for the first time with my Filipino blogger friend, Ishmael Ahab. 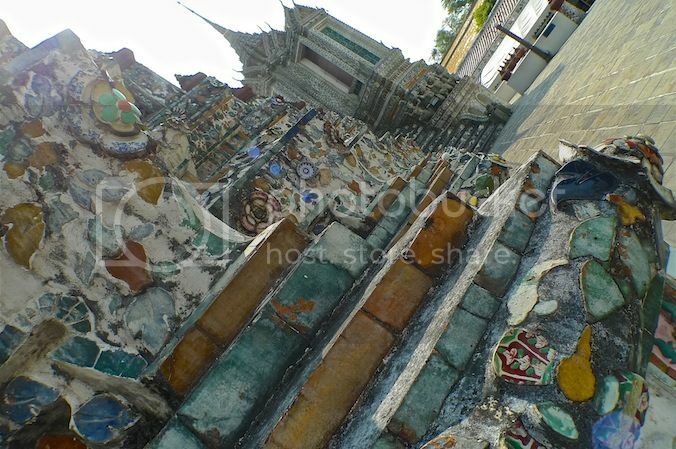 The best time to visit Wat Arun is during dawn when the early morning sunlight reflects off the surface of the temple. 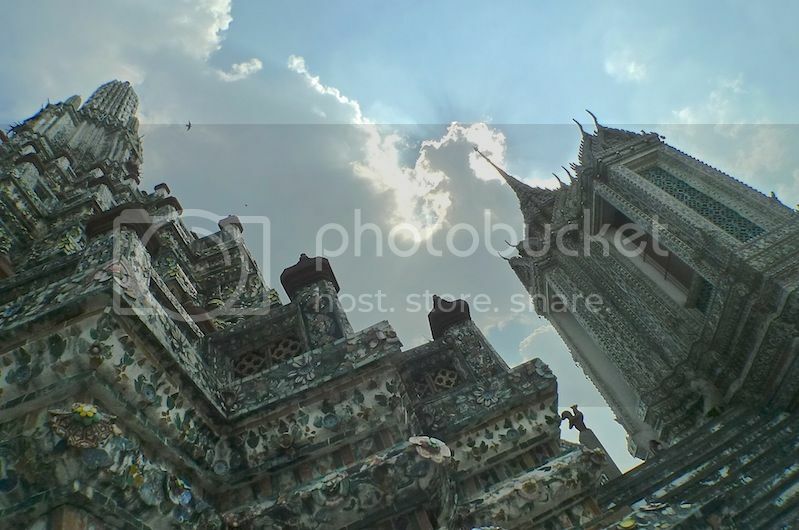 The temple is also said to be quite beautiful during sunset. However, when we were there, the sun was already high up in the sky. 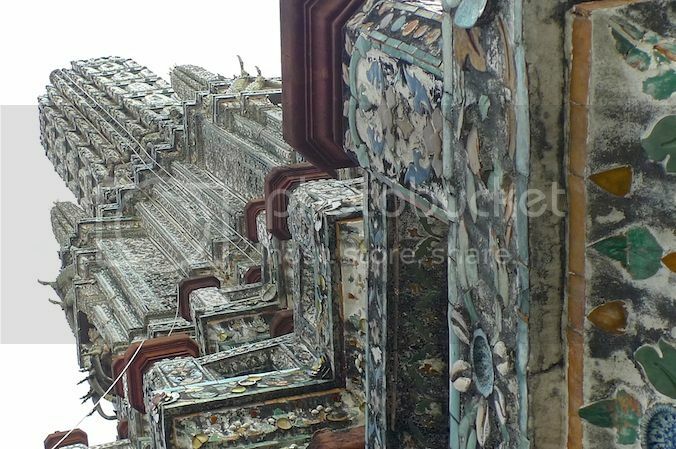 Our timing was not perfect, but I still enjoyed Wat Arun! 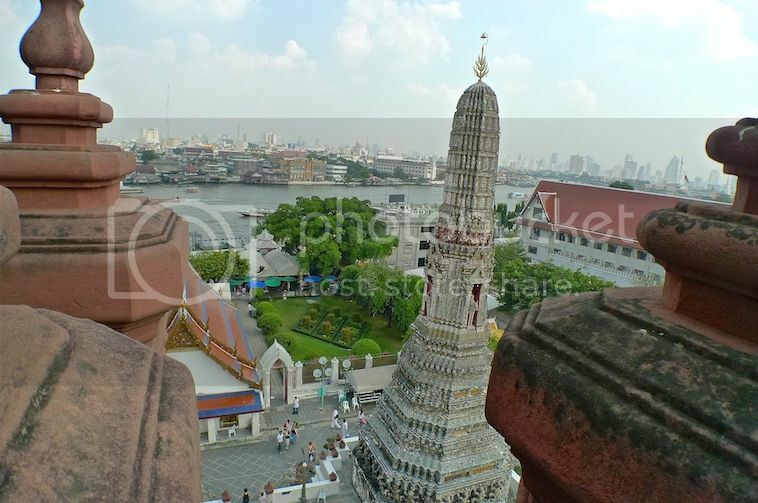 Having visited the Ubosot or the Ordination Hall and the courtyard, we continued with the major attraction at Wat Arun - the tall spire called prang. 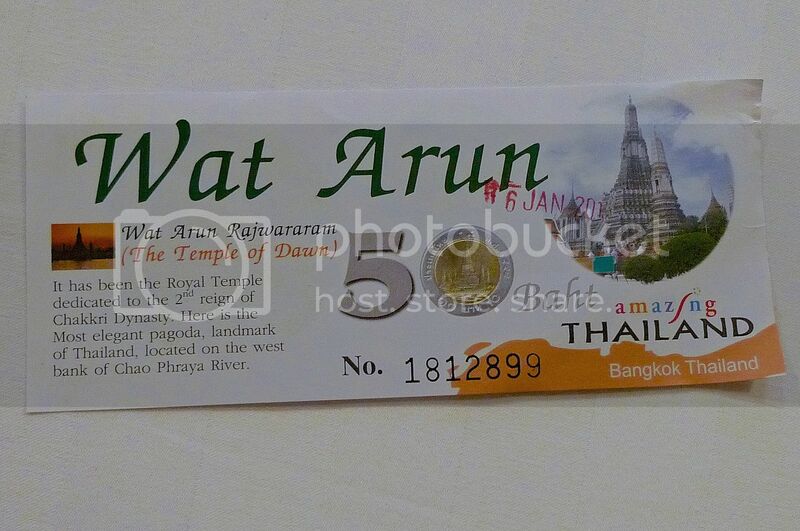 The entrance fee to the Wat Arun prang is 50 baht (US$1.60 / RM5). I was quite amused by what was written at the back of the ticket. Do not dangle any doll? LOL! 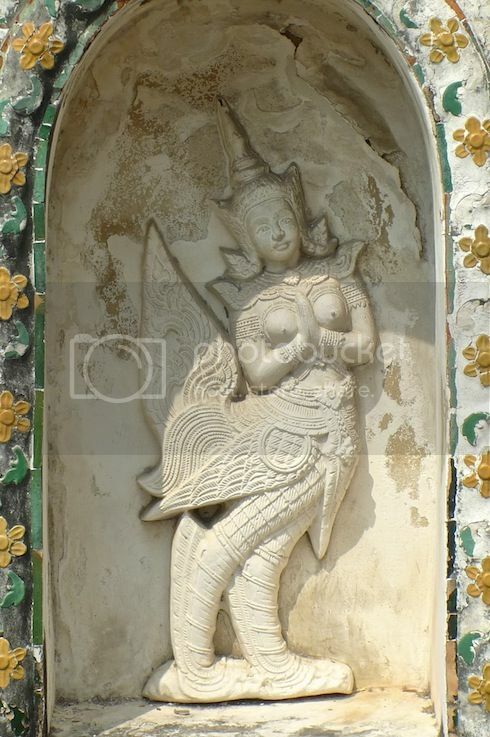 I saw a pair of deities standing guard at the entrance. 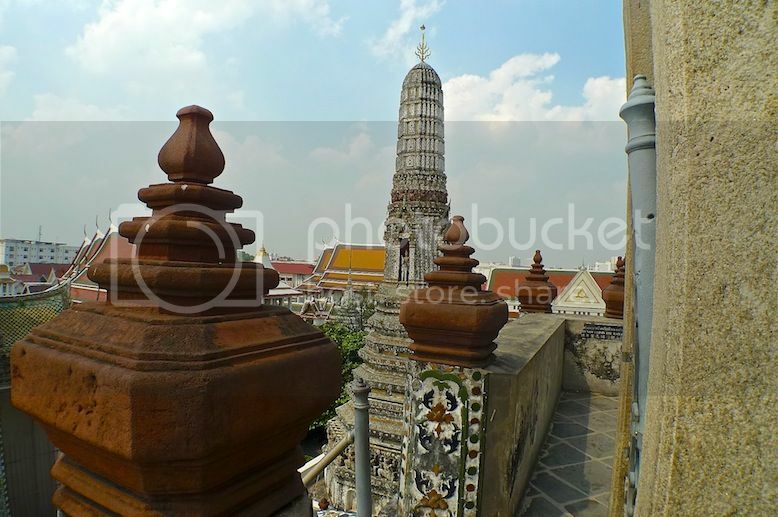 Wat Arun is actually made up of a main central tall prang which is flanked by 4 smaller prangs at the corners. 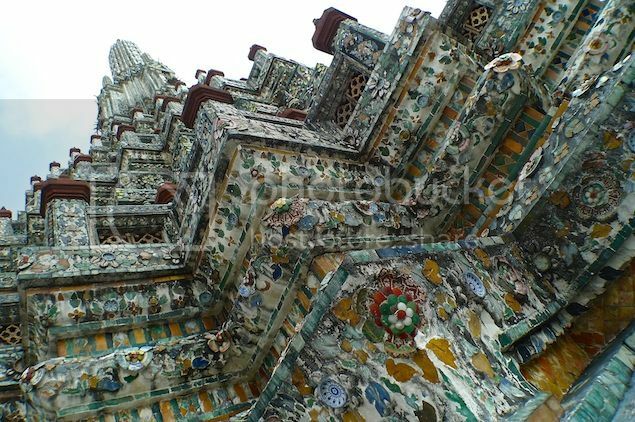 The prangs are beautifully decorated with seashells and porcelain which made them glow in the sun. 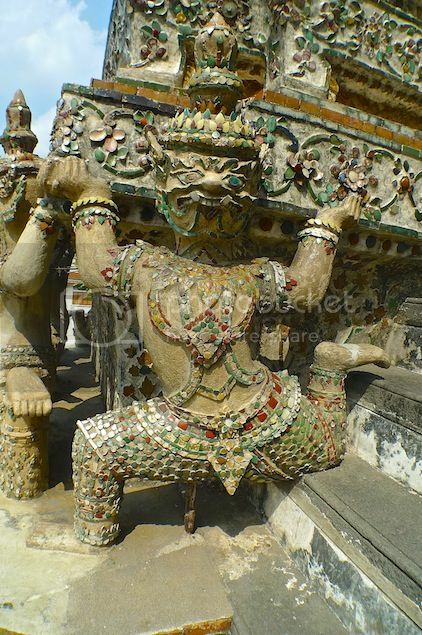 Demon figures are seen lifting up the central prang. 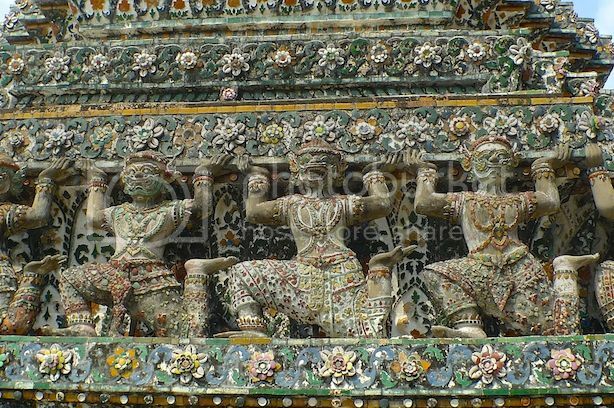 Below the demons are a row of carved figures. This is one of them. 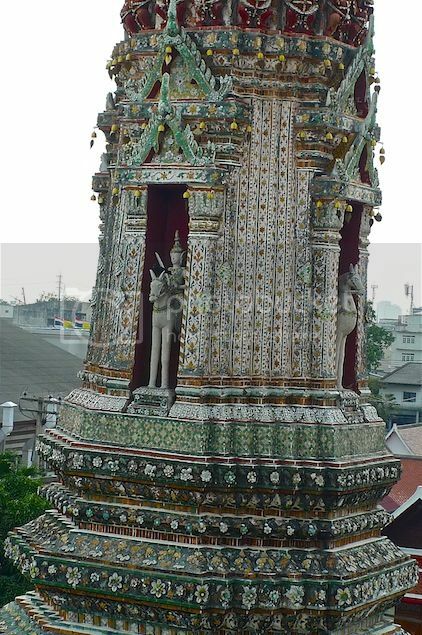 The central prang is a Khmer-style tower which represents Mount Meru, the center of the world in Hindu cosmology. 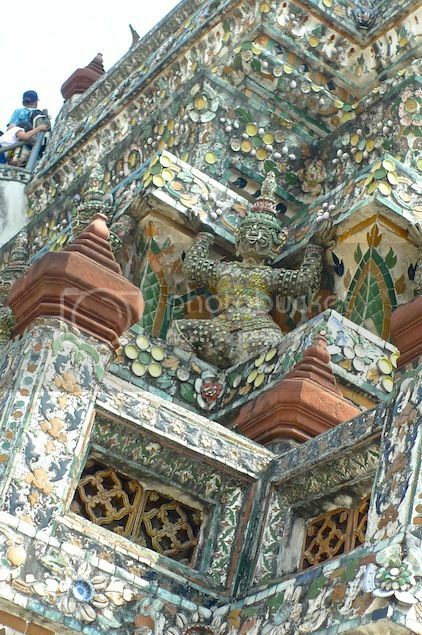 A close shot of a demon sculpture holding up the tower. 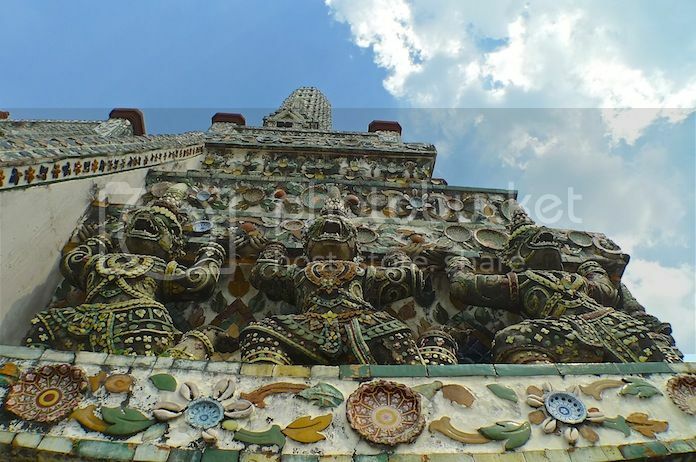 The base of the tower actually looks quite colorful with its multi colored ceramic tiles and porcelain which had previously been used as ballast by boats from China. Did we climb up this tall prang estimated to be at least over 70 metres high? You bet we did! 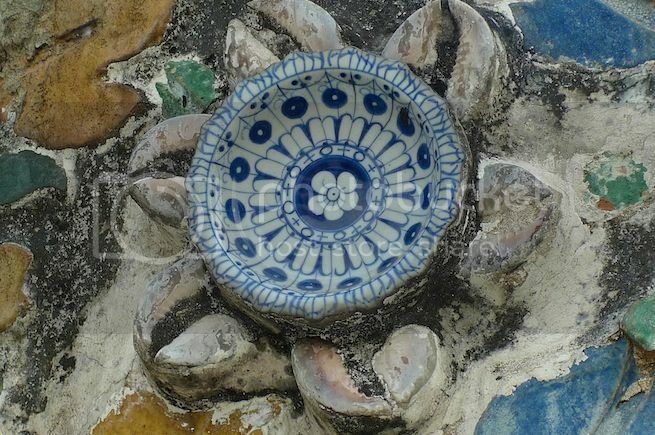 Look at this Chinese porcelain bowl decorated as a flower. Isn't it beautiful? I thought the view from here was rather dramatic! I felt like I was hiding from that evil eagle soaring above the skies scouring the earth searching for me. LOL! 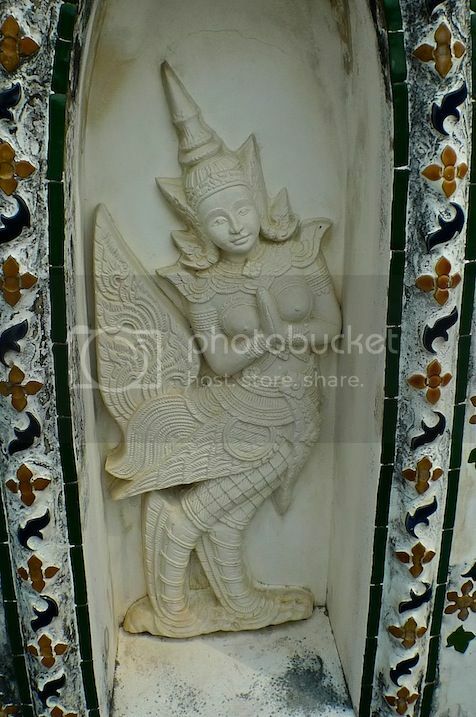 This must be one of the most beautiful temple in Thailand! 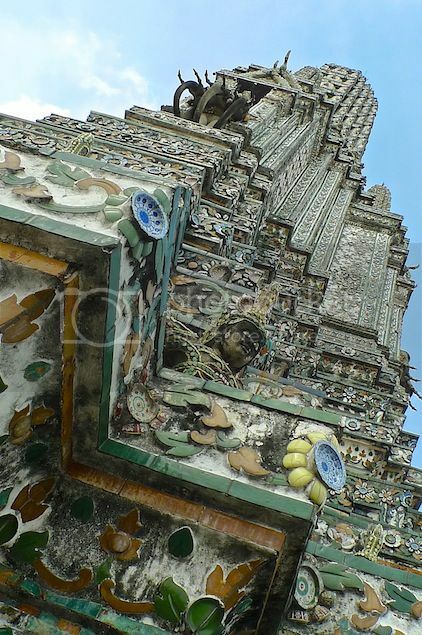 Just look at those amazing and intricate mosaic covering every part of the tower! As we climbed up the stairs of the main prang, we could see one of the four smaller prangs. 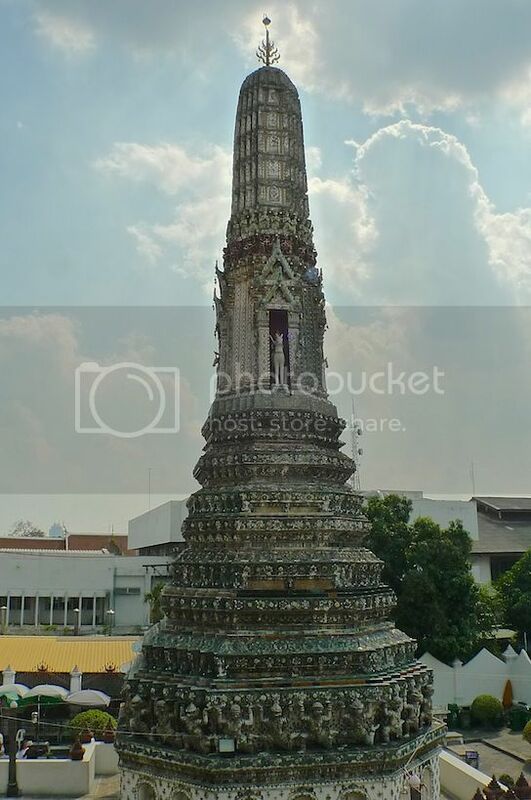 If not mistaken, I think it holds the statues of Phra Phai, the God of Wind. 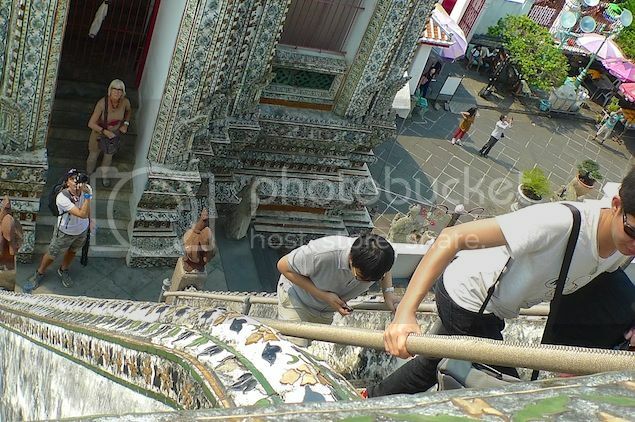 The steps up were rather steep and narrow, but luckily there were railings to hold on to. 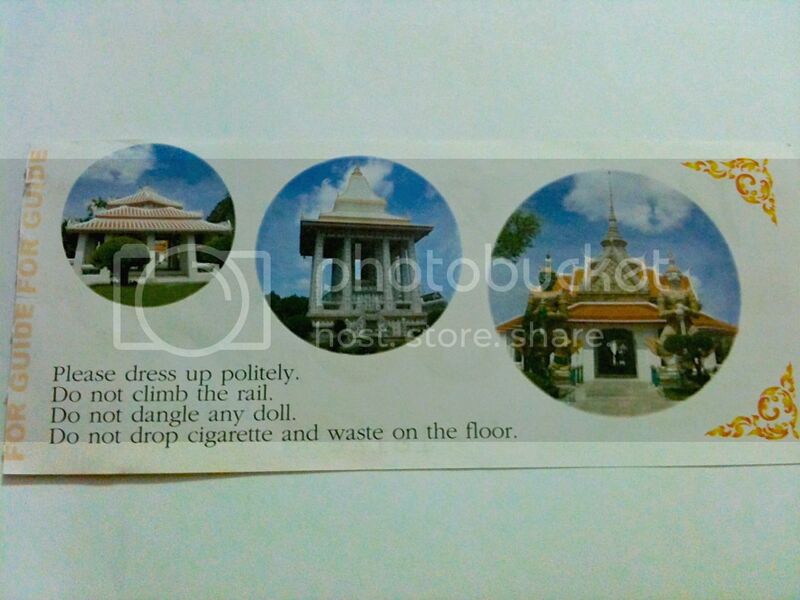 If someone above the stairs were to fall, it would be like a domino effect, with everyone below rolling down as well. A frightening thought indeed! 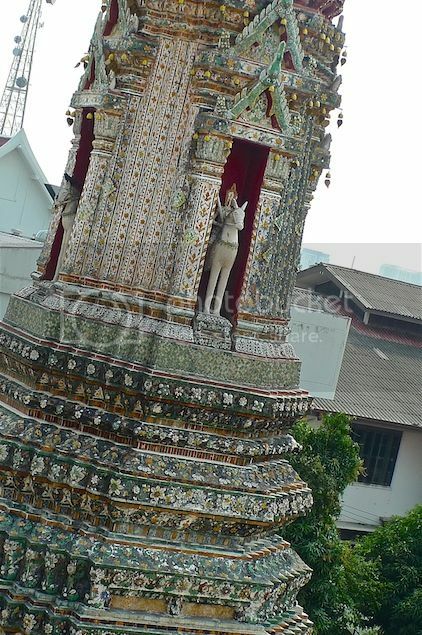 An enlarged shot of the Phra Phai, God Of Wind riding on a horse. There were four of them, each facing the four major directions. 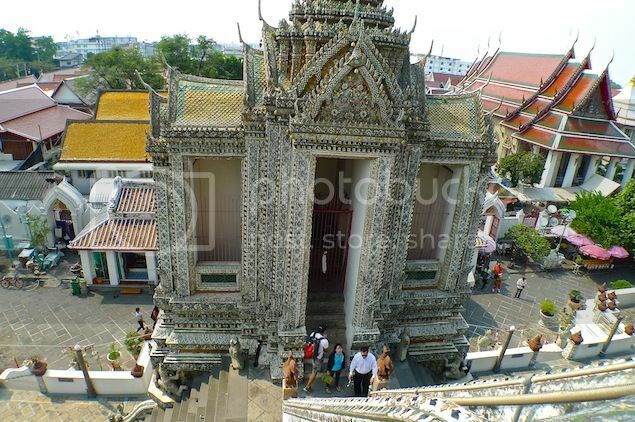 I have a fear of height, so climbing up the steep stairs was quite scary, but manageable. 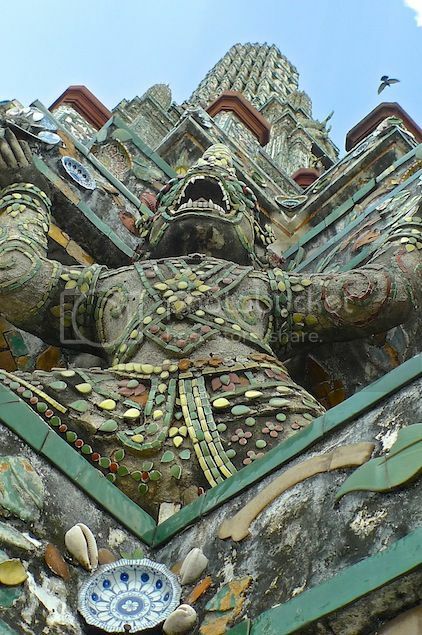 I said manageable because it was nothing compared to my experience of climbing THIS temple in Cambodia back in 2010! More sculptures halfway at the top. We only managed to climb up to the 2nd level of the prang. The higher level was blocked maybe because it was too dangerous? But it was good enough for me. I took a picture of this right above my head. Amazing view. Luckily, there were not that many tourists that day. The walking area at the the 2nd level was pretty narrow and could get quite crowded if there were more people. I leaned out to take a photo of this man at the top of the staircase taking a photo. LOL! 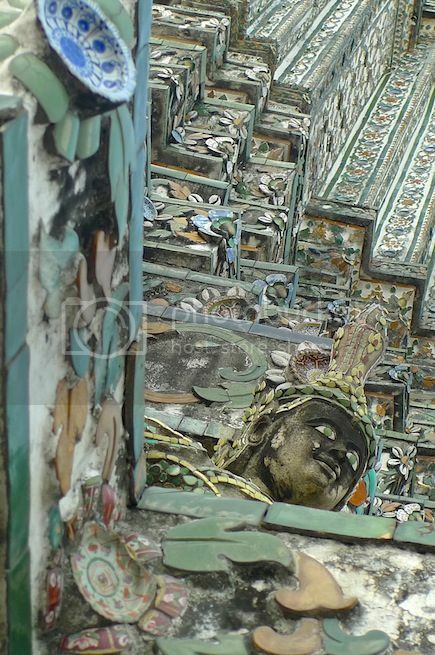 Another shot of the Phra Phai inside the smaller prang. When I noticed no one was blocking the stairs, I quickly took a shot. It's not easy to go back down as you can't simply walk down. 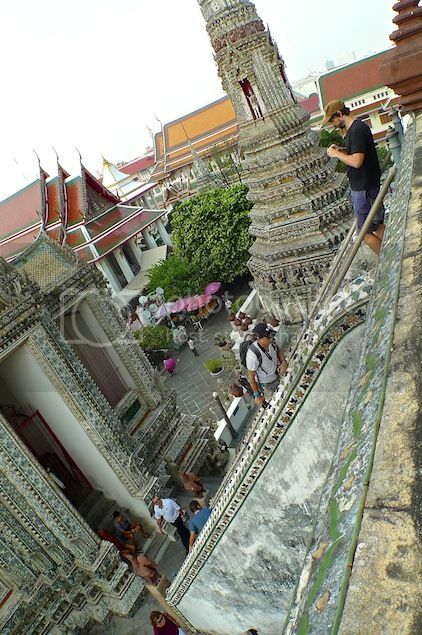 The steps were too steep and narrow! 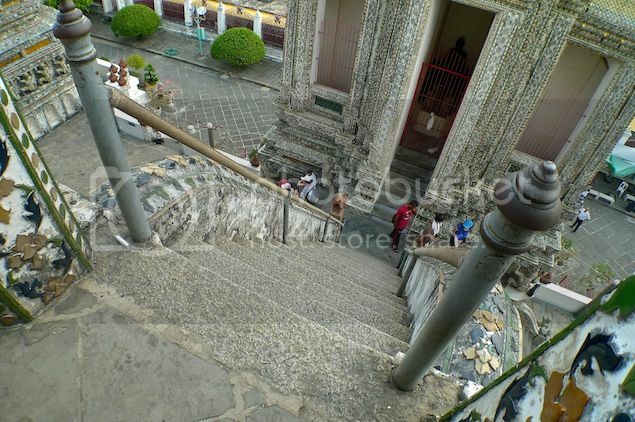 You have to go down the same way you climb up, that is facing the steps and holding the railings for support. Walking round the narrow walkway, I looked up and was a little shocked to see a black face. Looking up higher, I also noticed what looked like three elephants' tusks. An enlarged snapshot of the black face. The three elephants' tusks were way too high up for me to take a proper photo. 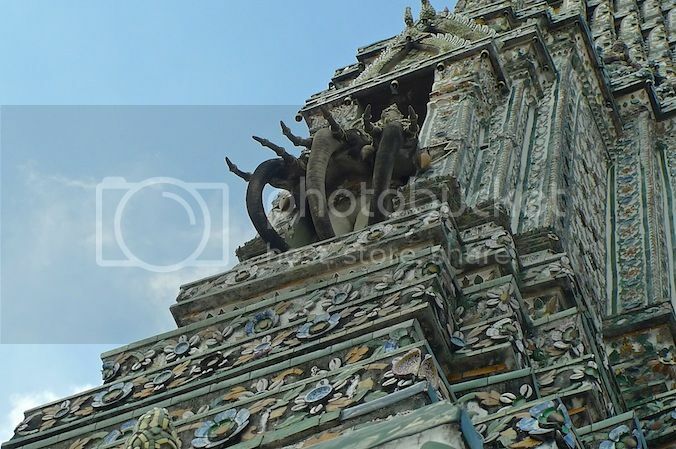 It's actually a statue of the Hindu God Indra sitting on a three-headed elephant or Erawan. 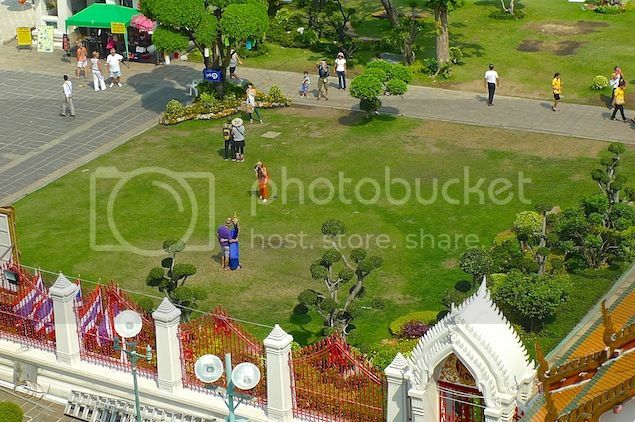 Read more about the three-headed elephant at my post The Erawan Museum In Bangkok. 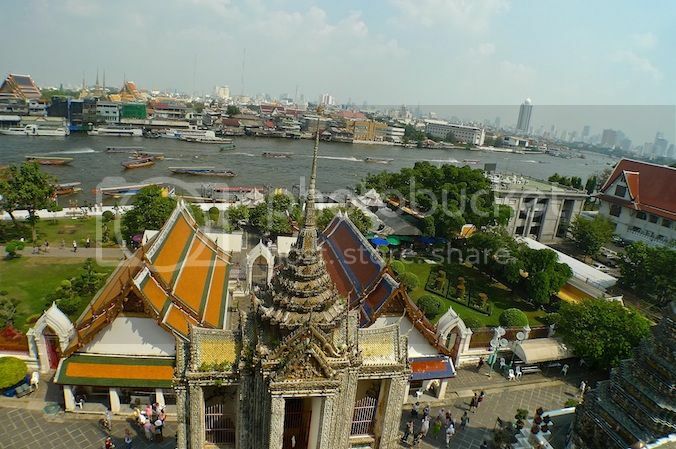 The view from up here overlooking the Chao Phraya River was pretty awesome. 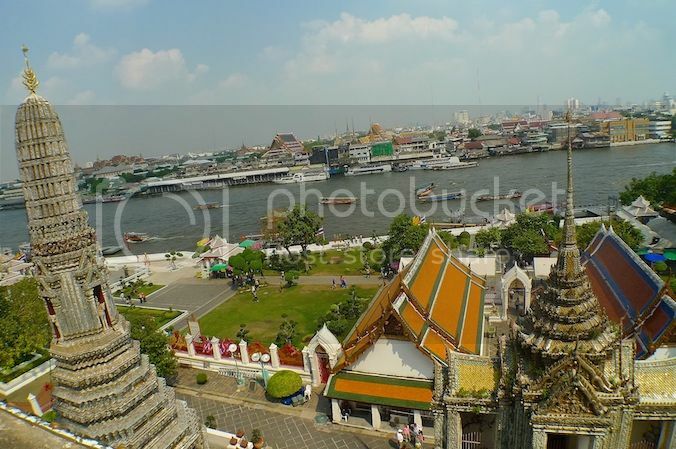 The view of the Chao Phraya River. One of the four smaller prangs seen here with the river in the background. Having seen enough, it's time to descend the tower and go for lunch! What did we eat for lunch? That's for you to find out in my post coming up next!